Just in case you were wondering what's in a Friday for CraftyAndy , I got up early, 730 AM, and went to the gym, as I do on my Mon-Wed-Fri routine. I actually drag myself out as for some reason wether is the medications, old age, or AIDS or some hidden syndrome they can not diagnose, I am always tired. Going to the gym and doing some Cardio always gets my blood pumping and the energy goes up at least for 3 to 4 hours. weird stuff on my skin, I got dressed up. San Francisco has a mild winter, but today was around high 40s. 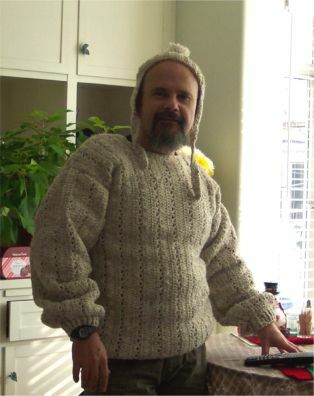 The Hat and the sweater are made by me. After I got dressed went to my other daily errands, the mail, the bank, the cute boy with the warm croissants, LOL, just kidding. 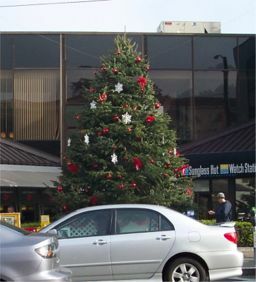 I promised a friend of mine that I will take some pictures around and show him some of the local natives and their holiday spirit. What do you know, in the store called "Does your Mother Know" there is a display and there is a set of dolls from RuPaul and if you don't know who RuPaul is better click on her name, she has a doll. Now I don't know about you folks, but she has a doll, she is the most famous drag queen have ever known in my life. That puts her up there with GiJoe and Barbie, the Doll has an inscription that reads "99% Plastic, 1% Woman" Amazing, only in San Francisco and the Store "Does Your Mother Know". Here you have yet another window display. But I did not stop there, I wanted to show my friend the Community Tree in front of the Bank of America or what they call Hibernia Beach. It is called Hibernia Beach because some time ago, the were shirtless men taking the sun in front of the bank which at that time was called the Hibernia Bank. So here in the middle of the Castro there was a place to sun yourself in your lunch break, the view was very diferent. Well this was not all I did, I went to the Mission or what we puert orricans will call "El Barrio" and I got very ethnic as you can see. 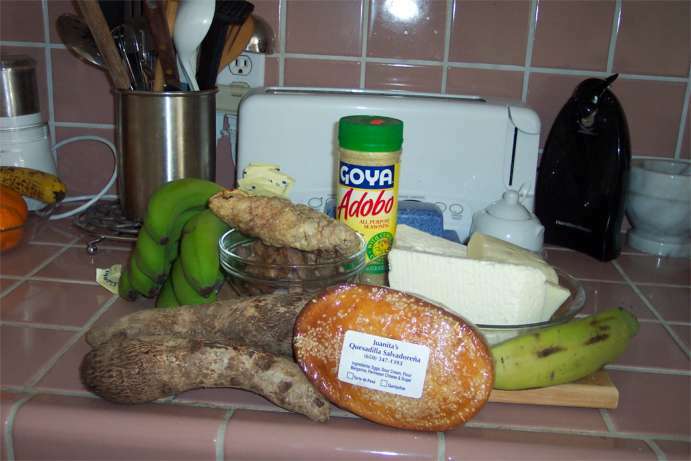 I got my cheeses including, fresco, cotija, oaxaca, I got malanga or Tarot Root, green bananas which are delicious boiled, you have to add a little milk to the water, otherwise it will stain the pot. A plantain , some carnitas (pork), some pork rinds and "Quesadilla Salvadoreña Juanita. ", a salvadorean pastry. Thus it ends my day on the streets and I am sipping my sugar free Hazelnut Latte. Thank you for stopping by, I hope you enjoyed your stay and please come back there may be more to tell during the weekend. I love SF. I've only been there once! But you know what...... in the near future, I might have an assignment in Berkeley for 6 months!! Andy, I love that sweater and the hat looks great with it. The picture of the food looks like a photo taken to be in Bon Appetite or Gourment magazine. I bet you and Mike eat some good, home-made dinners at chez Andres! I've been lucky to visit San Francisco one time. I wouldn't mind visiting again because it's such a beatiful city. I don't see how people afford to live there though. 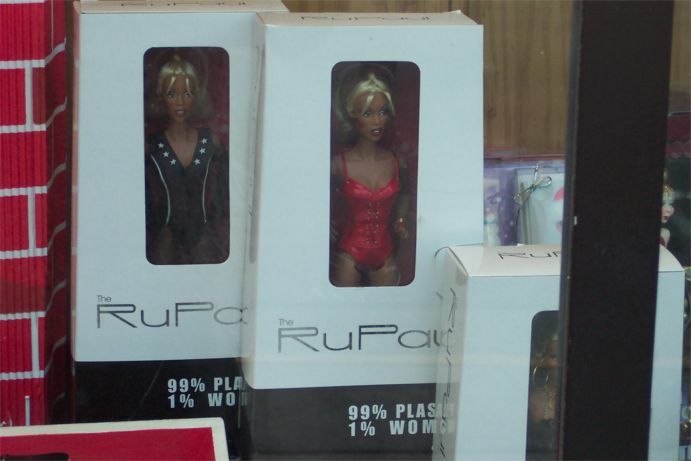 I totally want a RuPaul doll! However, they are $59.99! I love RuPaul, but not that much.